Comets are frozen balls of ice, dust, and rock that usually orbit far away from the Sun. Occasionally, the orbits of comets are changed by the gravitational pull of passing stars or other objects, and the frozen chunks fall down among the planets. As the frozen chunks approach the Sun, the ices on the surface are heated by sunlight and flow away, forming beautiful tails like the one above on Comet Halley in 1986. 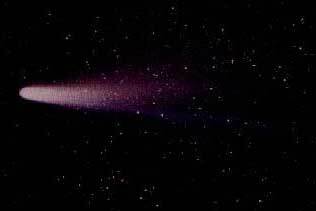 Image of Comet Halley courtesy of NASA Goddard Space Flight Center NSSDC. The solid part of a comet is usually small, only a few miles across or less. But some may be large, and their orbits sometimes cross the planets' orbits, so they may hit a planet. A very small comet exploded above Siberia in 1908. (Search for: "Tunguska"). 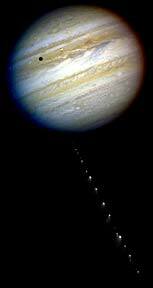 A much larger comet passed close to Jupiter a few years ago and broke into about twenty pieces. These pieces formed a string of comets like cars on a track that looped around and crashed back into Jupiter. 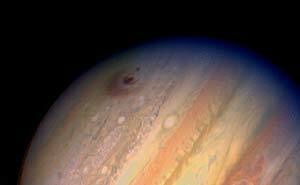 Composite image of Comet Shoemaker-Levy and Jupiter courtesy of NASA/JPL. As each piece of comet slammed into Jupiter's atmosphere, it made a giant explosion visible from the Earth. The series of images below show a sequence taken from the Galileo spacecraft, while on its way to Jupiter. You can see the fireball form and then fade. It may not seem very impressive until you realize that the planet is Jupiter, and that the fireballs are almost as large as Earth! The comets exploded in Jupiter's atmosphere, so they did not make permanent craters (Jupiter has no solid surface). But they did leave huge blotches of dust floating in the atmosphere that were visible for months. Images courtesy of NASA Goddard Space Flight Center NSSDC. If you want to learn more about these collisions with Jupiter, try a search for: "Shoemaker-Levy 9".